- 28 tableau piles - pair the top card of the stock with the top card of a pile where the ranks add to 14. 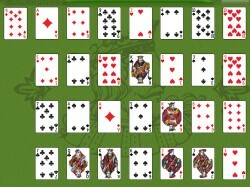 Valid pairs are A-K, 2-Q, 3-J, 4-10, 5-9, 6-8, 7-7. Piles may contain more than 2 cards (for example, the pile may begin with an 8, a 6 can be played on it, then another 8, and so on). Cards cannot be moved from one pile to another. The game ends if the top card of the stock cannot be played to a pile. The game is won if all the cards are placed on the tableau. - stock (top left corner) - cards are built on the tableau. - 25 piles arranged in a 5x5 square - discard pairs of cards that add to 14, if they are in the same row, column or diagonal. For example, a King and an Ace, a Queen and a 2, or an 8 and a 6. To remove a pair, pick up one card and drop it on the other. Spaces are filled automatically from the stock. At the start of the game 1 card is dealt to each pile. - stock - while empty, condenses the whole tableau by clicking. - 25 piles arranged in a 5x5 square - discard pairs of cards that add to 14, if they are in the same row or column. For example, a King and an Ace, a Queen and a 2, or an 8 and a 6. To remove a pair, pick up one card and drop it on the other. Spaces are filled automatically from the stock. At the start of the game 1 card is dealt to each pile. - Fill cell - when all available pairs have been discarded and the stock is empty, clicking the fill cell fills spaces from left to right in the top row with cards taken from right to left from the bottom row.